In quality management system, preventive action, corrective action and defect repair terms are probably the most commonly used key terms. If you know the differences between them, you will have a better understanding of the quality management processes. Many people can easily understand the defect repair concept. However there is a little difference between corrective action and preventive action. Therefore a lot of people find difficult to understand their differences. In this article we are going to discuss these widely used quality management terms by using examples so that you will easily understand the differences between them. When the product or deliverable does not meet the quality plans or requirements, defect repair process should be implemented. You replace or repair the defective part of the product in this process. For instance let’s say that you are manufacturing auto spare parts. You noticed that some of your products are beyond the quality limits. Their thickness is greater than the others. You will make an inspection and decide if it can be repaired. If it is possible, you will take actions to correct them. If it is not, you will replace them. 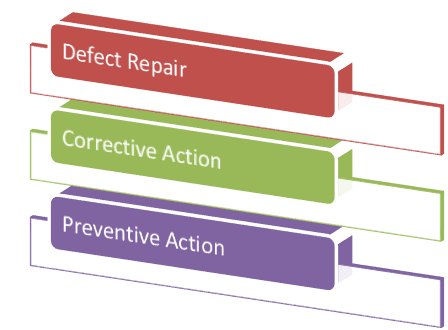 Corrective action can be conceivable as a future response to the defect repair process. The aim of corrective action is to restratin the reoccurrence of the problem. For instance, let say that you made an inspection and detected some defective products. You implemented defect repair process and corrected the defective parts of the product. You don’t want to encounter the same problem. So that you must detect the root cause of the problem, implement a solution to ensure that the defects do not occur again. In other words, corrective action is a reactive process that seeks to detect the root cause of the problem to stop it’s reoccurrence. In project management, corrective actions should be taken when the project has deviated from the planned scope, schedule, cost, or quality requirements. They are used to bring the project’s performance back into alignment. Unlike the corrective action, preventive action is a proactive process that is taken to avoid any anticipated future defects that may appear in the product. For instance let’s say that you will start manufacturing auto spare parts. Before to start the manufacturing process, you analyzed your manufacturing system and procedures to eliminate the factors that may affect the quality of the product. So that the anticipated defects could be prevented. In project management, preventive actions are proactive in nature that are implemented to ensure the project doesn’t deviate from the baselines. Assume that we are building a taxiway apron and we planned to use a batch plant with a capasity of 200 m3/day. Once concrete pouring begins, we realize that the capasity of our batch plant is not sufficient and we are now behind the schedule. Bringing a high capasity batch plant is a corrective action. We noticed that silica fume admixture that we are using in our concrete mix design is very expensive and we are bringing this admixture from 500 miles away. As per our market investigation, we find another supplier which is closer to our worksite so the price will be lower. This is a preventive action. Upon preliminary inspection of the concrete strength, we find that the strength is lower than planned. We asked our batch engineer to change the mix design. This is a defect repair. Corrective actions and preventives actions are activities done to provide the project performance align with the baseline and have no direct relationship to the quality of the outputs. But defect repair activities have direct relationships to the quality of the outputs. In this simple example, bringing a high capasity batch plant, finding another supplier for silica fume and improvig the concrete strength are under the responsibility of the project team. These actions would not affect the project scope and baselines. However if the client changes the design or demands to increase the thickness of the concrete, that would be a scope change and the baselines would be updated. In project management, change requests may involve preventive actions, corrective actions, and defect repairs. However in scope changes, you may update the project scope, baseline schedule and baseline costs. Preventive actions, corrective actions, and defect repairs should not be used to justify a baseline change. Defect repair process is used to repair the products or deliverables that do not meet the quality requirements. In corrective action you deal with the non-conformance events that happened in the past. You determine the root cause of the problem to restratin the reoccurrence of it. However in preventive action, you deal with the potential non-conformance that may happen in the future. The costs related with defect repair, preventive action and corrective action are internal to the organization. Cost of scope changes that the client has asked for, are paid by the client. Change requests must be documented and updated into change management system. In this article we analyzed the corrective action, preventive action and defect repair terms with the help of exampls. Note that this is an important concept from a PMP or CAPM Certification Exam point of view. You may encounter some questions related with their differences.